@motorcyrubjang is one of the more enjoyable people to follow on twitter for a local, street level perspective of Bangkok and Thailand. The twitter feeds is in English and Thai and is run by a motocye (motorcycle) taxi driver that is from Sisaket Thailand. I don’t know him, this is not a promotion for him, but simply ‘maybe this is what the internet was for’ comment. 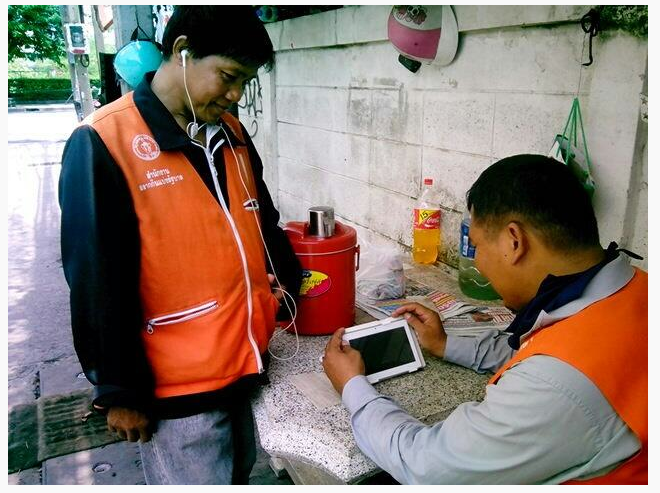 If seeing a group of motocye taxi drivers gathered around a tablet to learn English and about social networking doesn’t make you smile and think the ‘new’ world is an open world full of opportunity, I don’t know what will. 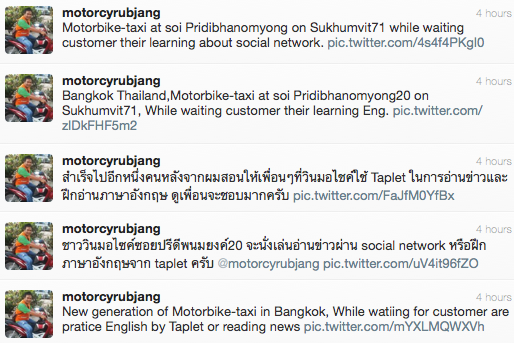 This entry was posted in Culture and tagged english, motocye taxi bangkok. Bookmark the permalink.